Best Performance, Inc. has developed a new, innovative, vertical bulk material conveyor. The lift tremendously reduces degradation of materials, increases efficiency, and helps improve the safety of the work place due to its extreme health hazard prevention components, such as being virtually dust free. The new ideas behind this conveyor are ground-breaking and extremely beneficial to companies that utilize bulk material handling equipment. The Bulk Material Lift can be scaled to meet specific customer specific needs. Scalability depends on a few factors, such as bulk density of material that needs lifted, moisture content, flow rate requirements, and other special considerations. Need more info? The principal behind this machine is very straight forward. 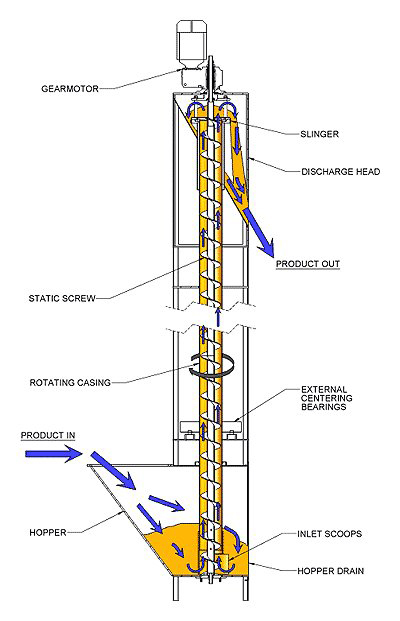 At the center of the machine is a fixed lift screw that is fastened to the bottom of the inlet hopper. A casing with scoops attached rotates about the fixed lift screw.